Live Butterfly Garden Indoors at Natural Bridge Va! Amazing Live Butterfly Garden at Natural Bridge Va! 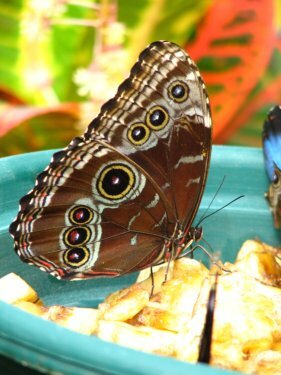 Visit the indoor, Live Butterfly Garden at Natural Bridge Virginia and discover the latest hidden gem in this area! This new exhibit has hundreds of types of butterflies, all in flight among beautiful tropical plants and trees. See this exotic South American Blue Morphe in it's natural setting! Learn about the butterfly life cycle and all of the butterfly stages from the metamorphosis to the magnificent finished creature at maturity. In this live butterfly garden they also have a seven foot waterfall and a reflecting pond. The price of admission is included in the Natural Bridge VA ticket. Be sure to check out the Virginia farmhouse facade on the back wall. This is where the emergent chambers are and where you can see the whole life cycle of the butterfly including when they emerge from the chrysalis or cocoon. I have always loved butterflies and I know I am not alone. There is a mystic about them. They seem to have an intelligence and a connection to humans. Many folks believe that loved ones who have passed on come back to them thru a light, airy, magical butterfly. A friend of mine lost her 16 year old daughter in a tragic auto accident. The daughter always loved butterflies and seemed to be attracted to her a lot. After her daughter's death the mom was visited by a blue butterfly one day. It sat on a rock near her and seemed to just be waiting. After a period of time the mother told the dainty, beautiful creature "I am OK." Immediately the butterfly rose and flew away. My friend said she felt comforted. Oh! ... and by the way, blue was her daughter's favorite color! My own bird and butterfly garden is always a work in progress. Mine is not nearly as nice as the live butterfly garden at Natural Bridge but I still enjoy it. I love the bird song in the morning and evenings and I so enjoy the sight of butterflies flitting from flower to flower. They really love the bright flowers that grow in full sun. I enjoy looking in my Spring Hill Nurseries mail order catalog to see what they recommend for my area here in Richmond, Virginia. Most nurseries and seed and plant catalogs carry a plant specifically called butterfly plant. Not sure what the scientific name is for this plant but they do indeed attract a lot of butterflies! Have Your Own Live Butterfly Garden! First trick for attracting butterflies is to place your live butterfly garden plants in a sunny location that is protected somewhat from wind. Because butterflies are so delicate they have difficulty staying on plants if it is windy. Placing a few flat rocks or stones in your sunny garden will allow the butterflies to sit and soak up the sunshine and to rest. Pink Mist Scabiosa (Scabiosa columbaria - Pink Mist) Attracts hummingbirds and butterflies. Gay Butterflies Butterfly Plant (Asclepias tuberosa)Blloms throughout the summer. Tomato Soup Coneflower (Echinacea Tomato Soup) Check this out! The bright color will attract hummingbirds and butterflies! I just go crazy when I get these flower catalogs in the mail! What is Your Favorite Part of the Live butterfly Garden? 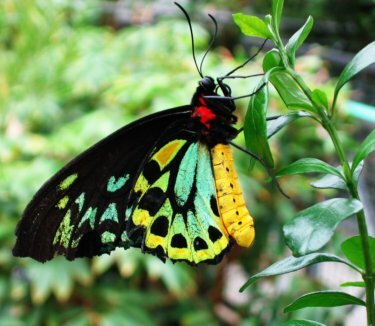 Tell us about your visit to the indoor, live butterfly garden at Natural Bridge Virginia! I love butterflies and loved this exhibit!! Lots of things to do and see at the Natural Bridge.